The Adeptus Mechanicus Forge World of Firmamentum is found deep in the Cygnus Arm of Segmentum Obscurus. 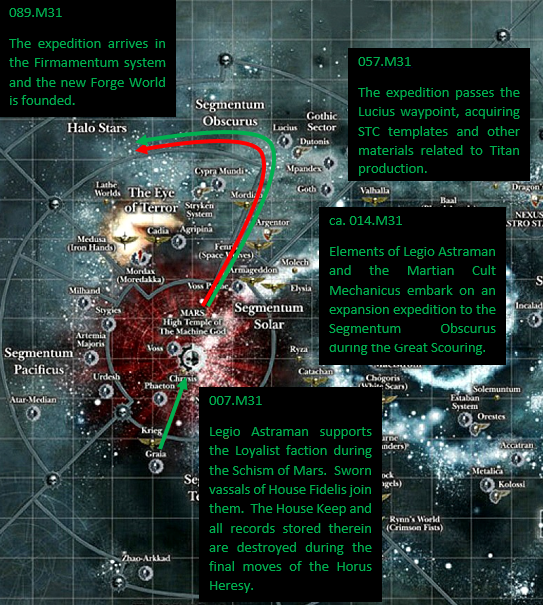 A relatively young Forge World, Firmamentum was colonized in 089.M31 as part of the effort to rebuild the Adeptus Mechanicus in the ashes of the Horus Heresy. It is located in a relatively quiet area of Imperial control and benefited from an unusually long period of peace on its own soil from the Moirae Schism in ███.M35 until the unexpected arrival of an Ork-infested space hulk in 975.M41. DATAFILE 1: Typical skyline on Firmamentum. Firmamentum has maintained a very respectable reputation for its understanding of melta- and plasma-based weaponry, though not nearly to the levels of fanaticism evidenced by Ryza. 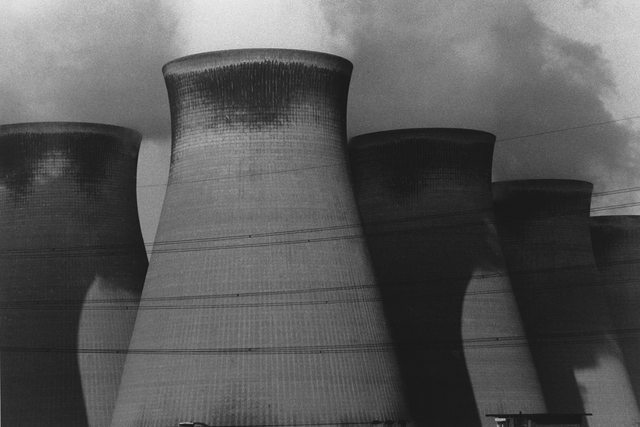 Monumental cooling towers cluster around its hives and forges, and banks of radioactive storage pools provide a stark contrast to the ashen wastes surrounding them. Firmamentum supplies not only specialist weaponry for nearby Munitorum depots, but also the titanic reactors for much of the sector Battlefleet. Major imports include indentured workers (fully-functioning or to be processed into servitors) and raw materials such as adamantium ore and promethium. DATAFILE 2: The emblem of Forge Firmamentum. 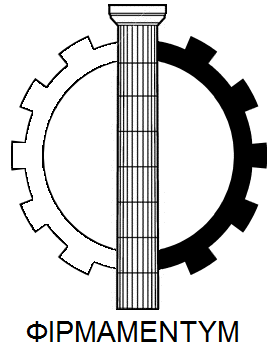 The symbol of Forge Firmamentum is the monochrome bisected cog of the Adeptus Mechanicus, overlapped with a Doric column of stone. Together they form the ancient letter Φ, the first in the true name of the Forge World and the representation of the Golden Ratio. Firmamentum’s colors are dark red and grey, in honor of the original Martian colonists. 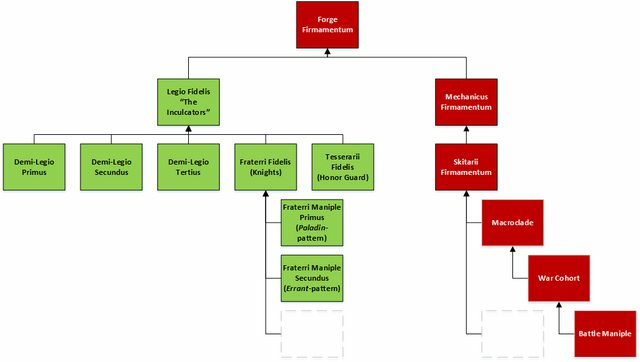 DATAFILE 3: The general structure and hierarchy of Forge Firmamentum. Among the first colonists of Firmamentum were several Titans of Legio Astraman, the Morning Stars, who had been called from the Forge World of Graia in Segmentum Tempestus to aid in the defense of Holy Terra. With them were brought the remnants of House Fraterri, an Imperial Knight Household whose original homeworld had been wiped clean during the Heresy and whose history has since been irretrievably lost. The ranks of the God Machines slowly grew as Firmamentum progressed towards full Forge World status, culminating in the foundation of Legio Fidelis, the Inculcators. Legio Fidelis displays the same cog-and-column emblem as its native Forge Firmamentum and its colors of green and yellow are an homage to its former ties to Legio Astraman. The Legio consists of three Demi-Legios of approximately 6 engines each. It maintains a pair of ancient Reaver-class Battle Titans; however, the majority of its heavy engines are of Warlord-class. Each Demi-Legio also includes several Warhound-class Scout Titans to support and protect their larger brethren. All Titans constructed on Firmamentum follow the designs of the Forge World of Lucius. DATAFILE 4: Lux Aeterna surveys the battlefield. House Fraterri has been fully annexed into the larger Legio to become the Fraterri Fidelis. Their original feudal roots have been all but forgotten, and have since been supplanted by the structure and traditions of the Collegia Titanicus. The smaller Knight chassis serve as skirmishers for the larger Titans, operating in closer quarters and against smaller and more agile foes than the main battle engines can effectively engage. The Fraterri are divided into Maniples of three Knights, all of the same pattern. It is expected that multiple Maniples will operate in tandem to complement each others' weaknesses. Service in the Fraterri Fidelis is used as training for prospective Moderati, who will eventually serve on the larger Titans. Many Hastati, or Knight operators, form close bonds with their engines and choose to stay in the Fraterri. The majority, however, are transferred into the Legio and their previous engines are reassigned to new operators. Due to this steady turnover, and relatively higher combat losses, individual Knight engines are not given the same honorifics as the more distinguished Titans – instead of a name, they have only a designation. DATAFILE 5: Knight engines of the Fraterri Fidelis. Due to their origins in different Forge Worlds, the Legio and the local Cult Mechanicus keep a professional but at times strained relationship. Legio Fidelis is fiercely loyal to the Forge Firmamentum; however, they maintain their own separate traditions and reserve a high degree of autonomy. That being said, Fidelis does work as closely with its assigned Skitarii macroclade as most other Legios. The Legiones Skitarii of Forge Firmamentum reflect their homeworld’s status as a relatively young Forge World in their weaponry and tactics. Many of the more ancient and, some would say, bizarre weapons and equipment have been replaced with newer and less-refined technology. 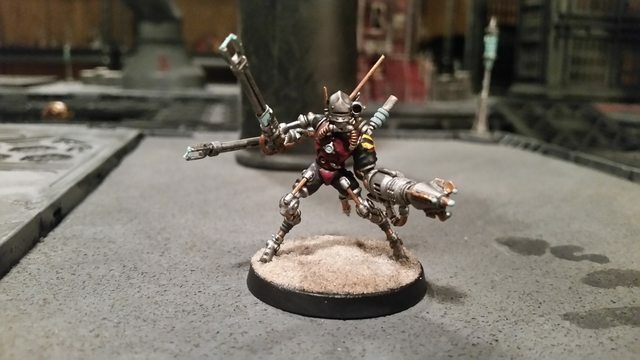 Owing to the specialization of their Forge, the Skitarii Firmamentum make frequent use of plasma- and melta-based weaponry. These are supported with a heavy emphasis on fortifications and methods of siege-craft. Man-portable ion shields and defense lines are common, as are Tarantula-pattern autonomous sentry platforms. 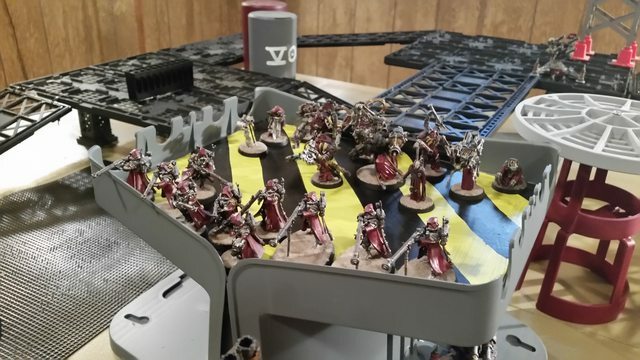 DATAFILE 6: A garrison unit of Skitarii Firmamentum guards access to the upper levels of an industrial complex. 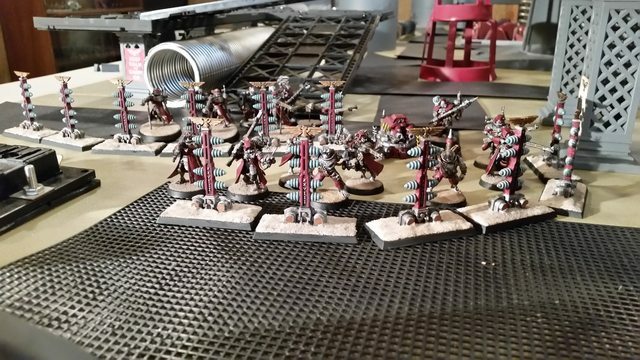 The Skitarii Firmamentum provide the majority of infantry support to Legio Fidelis in the form of Macroclade 633. However, the Legio does maintain its own small corps of soldiers in the form of the Tesserarii Fidelis. In practice, the Tessararii serve more as an honor guard for the Legio’s Principes and Hastati than as a frontline fighting force. However, they are both well-equipped and well-trained for operations in which closer monitoring by the Legio is required. DATAFILE 7: Hastatus Seniorus Onesimus Rehor and Fraterrus Primus. Onesimus Rehor is the current Hastatus Maximus of the Fraterri Fidelis. His is Fraterrus Primus, an ancient Paladin-pattern Knight engine. As one of the longest-serving members of the Fraterri, he is in line for ascension into the ranks of the Legio. Rehor is a man driven by ambition, and is laboring towards eventual Princepture of a Battle Titan. In the meantime, he is fiercly loyal to the Hastati under his command and champions the needs of the Fraterri within the greater Legio. DATAFILE 8: The amniotic casket of Princeps Paulus Aleksandr. Paulus Aleksandr is the Princeps of Lux Æterna, a Lucius-pattern Warlord Titan in Demi-Legio Secundus. He is a relatively young Princeps and only 87% augmentic, relying on his amniotic casket both for sustenance and for direct interface with the MIU of his engine. He is rarely seen away from Lux Æterna, spending the time in transit between warzones in a chemically-induced coma to ward off the effects of Manifold withdrawal. Princeps Aleksandr has served for 34 operations, spanning 153 years and has developed a reputation of being supremely competent. DATAFILE 9: Magos Grievious of Mechanicus Firmamentum, with attendants. 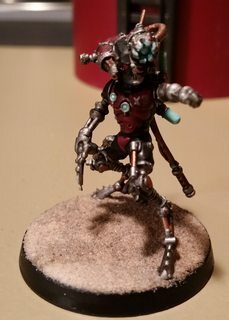 Magos Grievious is a high-ranking member of the Mechanicus Firmamentum, specializing in archeotech. The Skitarii Firmamentum, who he will not hesitate to sacrifice to his objectives, venerate him as being touched by the Omnissiah while certain members of the Legio Fidelis consider him to be blatantly dangerous and in dire need of cognitive reimaging. 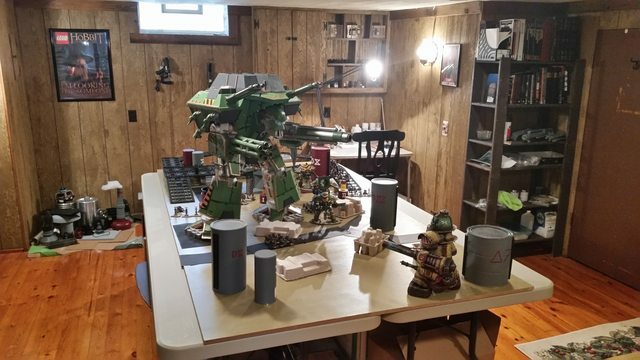 An expansion expedition, consisting of elements of Legio Astraman and the Martian Cult Mechanicus, founds the Forge World of Firmamentum in the Finial Sector. DATAFILE 10: Foundational history of Forge Firmamentum. Though far from Mars, Forge Firmamentum nevertheless becomes entangled in the Moirae Schism. Initial attempts at control are successful until the data-poisoning of Fabricator Abiram sparks complete anarchy. 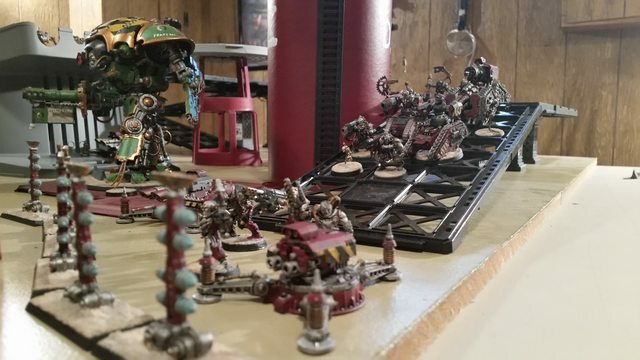 Warring factions of Mechanicus and Skitarii Firmamentum spiral into a vicious campaign for control of the Forge, until Legio Fidelis intervenes. 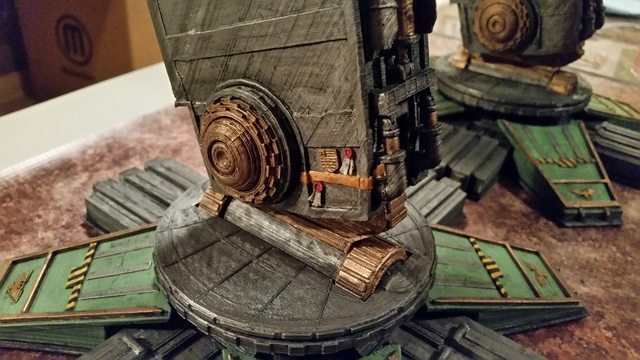 A new Fabricator is installed, the traitors erased and all records sealed to the highest degree. A worker revolt on the nearby resource world of Oberon erupts into heresy with the appearance of the foul daemons of Khorne. The Fraterri Fidelis and Skitarii Firmamentum are requested to pacify the insurrection in the foundry city of Abelheim, but fighting quickly spreads to encompass much of the sector. The Ordos Juris and Ordo Malleus spend the next four years vying for control of the operation. A demi-Legio of engines of the Legio Fidelis come to the aid of the shrine world of Antiphon, besieged by the pernicious Eldar. This would be the first combat operation of the lauded Warlord Titan Lux Aeterna, and of the eventual Princeps Maximus Paulus Aleksandr. A space hulk appears in the Firmamentum System. It is promptly shredded by the orbital defenses; however, wreckage and Ork landing craft fall on the Forge. The xenos immediately seize what technology they can and begin constructing crude war engines. The Titans of Legio Fidelis engage in a lengthy campaign against the Gargants, while the Skitarii Firmamentum clears the Forge sector by sector of any resistance. Battles rage for three years before Firmamentum is declared purged. Years ago the Legions of Discord assaulted Kimball Prime, destroying the primary Imperial manufactorum in the sector. Leaders of the in-sector armies of the Astra Militarum and Adeptus Astartes regrouped in secret. Drawn by the loss of a major manufactorum, the Adeptus Mechanicus joined their strategic auguries. Hungry for revenge, the Astartes proposed to conquer and cleanse the corrupted Chaos temple world of Barnes 595 - an act of symbolism over pure strategy. Although initially hesitant to partake in this emotional response, the Mechanicus was swayed by the promise of archeotech believed lost in the planet’s swamps and dead forests, or buried in the collapsed sub-basements of its byzantine shrines. 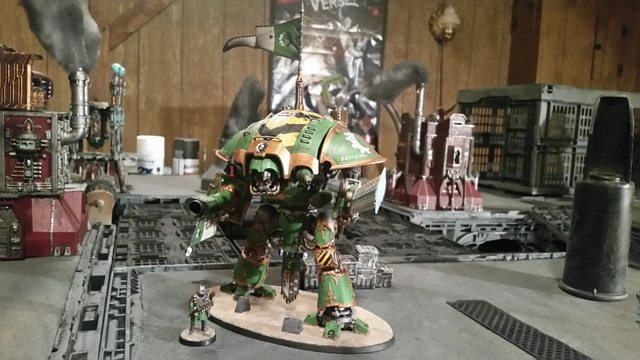 Two maniples of the Fraterri Fidelis, one maniple of the Skitarii Firmamentum and the venerable Warhound Canis Leto were rerouted to support the invasion. The steadfast troops of the Legions of Discord stood firm against the combined attack on the planet. With their strike forces extinguished or hastily falling back, by the end the Forces of Order had been rebuffed, claiming little more than their initial beachhead. Although not repulsed entirely from the planet, the effort to cleanse the temple world had ground to a halt, its only trace yet more bones rotting among the dead forests and abandoned shrines of Barnes 595. 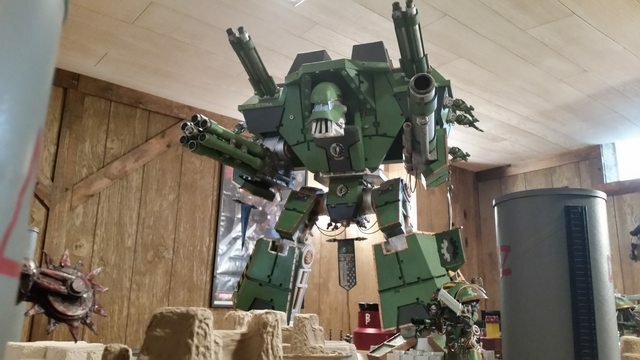 Firmamentum contributes two Demi-Legios of Legio Fidelis, four Maniples of the Fraterri Fidelis and three Macroclades of the Skitarii Firmamentum to support the defense of the Cadian Gate and surrounding area in the face of the 13th Black Crusade. The forces of Firmamentum were badly mauled in the following four years, but the survivors managed to extricate themselves before the destruction of Cadia. The 13th Black Crusade culminates in the formation of the Cicatrix Maledictum, a galaxy-spanning warp storm that cuts the Imperium in twain. For a time warp travel becomes impossible, isolating Firmamentum and stranding the surviving elements fleeing the destruction of Cadia. Eventually the eddies calm and intersystem travel resumes, however cautiously. Though on the grand scale the Imperium is deeply divided, on a smaller scale many individual ties are actually strengthened. Firmamentum becomes an even more vital manufacturing and trading hub for the surrounding region and establishes agreements with the Lathe Worlds in the nearby Calixis Sector. Over a century after the Noctis Aeterna, Firmamentum has rebuilt its martial strength and is engaged in multiple protracted campaigns in a number of systems within the Finial Sector. Echoes of the distant Plague War poison several population centers. Aeldari strike forces attempt to out-maneuver the vanguard of an awakening Necron Tomb World. Questing tendrils of a new Tyranid hive fleet have begun to strike outlying worlds. 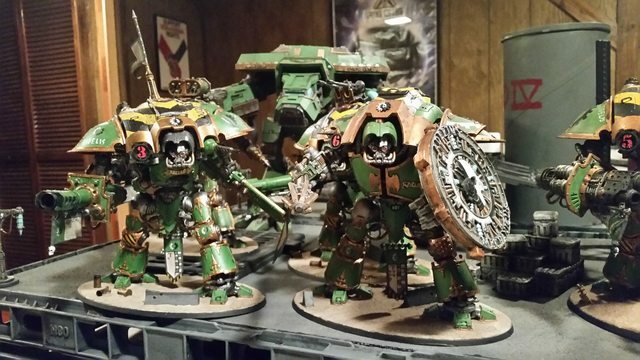 In the face of the deepening darkness, the holy engines of Legio Fidelis stand ever-ready to defend the Dark Imperium. Edited by CommodusXIII, 08 August 2018 - 05:29 PM. I can't really find much to fault here. Kudos, brother. Thank you very much! I'm always happy to hear feedback. DATAFILE 11: Battlefield pict capture of Unit ███-Chi-█. Eliminator Unit ███-Chi-█, "The Abomination of Cobol", is an experiment that never should have been. This monstrosity is the culminative work of Magos Organos Eriso Cobol in his study of psychic blanks or "pariahs". Magos Cobol attempted to enhance the latent abilities of these individuals through integration with Sicarian-pathway augmentation. His goal was to create the ultimate weapon against psykers and other eldritch dabblers in Warpcraft, and he succeeded beyond his darkest nightmares. Upon completion of the surgery, Magos Cobol promptly left the test chamber, deleted his memory storage banks, forcefully decommissioned his research staff and self-terminated. Some say that upon realization of what he had done, he was filled with guilt for his heretekal actions. Others say that he was terrified of the reaction of the Ordos Juris: Trial, torture and eventual disassembly or even worse, being forced to create more of these abominations. The body of Magos Cobol's research has been utterly erased beyond any possibility of retrieval, and as a bitter irony Unit ███-Chi-█ remains his final legacy. Considered too useful to be destroyed, it is kept locked in stasis deep within the vaults of Forge Firmamentum as a desperate weapon of last resort. Typically it is deployed via teleporter, hunting its intended target before being reacquired and secured until needed again. 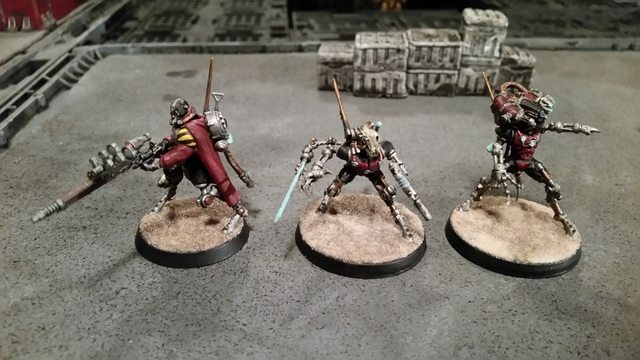 Unlike the Legiones Skitarii, Unit ███-Chi-█ is individually directed by a single Tech Priest handler who is immediately and mercifully euthanized upon completion of the mission. Thus, its activation is a terrible omen for both foe and Forge. Unit ███-Chi-█ is fitted with hybrid Sicarian-pathway augmentations and several additional modifications. Its neurostatic aura is enhanced by the abhorrent effects of its genetic defect, and channeled through the feedback circuits and null-arrays packed into its hideous skull-like helmet to become a focused weapon. Unlike normal Sicarians, the fleshform of this unit was not the result of battlefield injury but systematic vivisection - and no level of neural reimaging can erase that memory. It is remorseless, fearless, soulless and utterly inhuman in any way that truly matters. 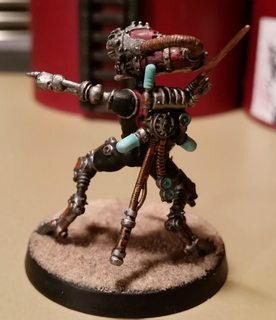 It is as close as the Adeptus Mechanicus has ever come to true exorcism of the flesh, but instead of a sense of accomplishment this... thing invokes only horror. Edited by CommodusXIII, 02 May 2016 - 06:40 PM. So much grimdarkness it hurts ! The defense of Sub-Sect Tau Gamma Theopheles was a minor, but much-lauded event in the campaign for Firmamentum. This refinery complex on the edge of the ash desert became the focus of the now-organized Ork war effort, necessary to provide fuel for their recently-constructed Gargants and Stompas. A mob of crude xenos engines bore down on the sub-sect from the northern wastes, while Legio Fidelis walked from the south with elements of the Mechanicus and Skitarii Firmamentum. The following datafiles capture the moment of initial contact, as the first Ork Stompa enters the close engagement zone. Princeps Paulus Aleksandr and Lux Æterna form a foundation of resistance, with support from two Maniples of the Fraterri Fidelis. DATAFILE 13: Lux Æterna prepares to engage approaching Gargants on the horizon. DATAFILE 14: Onesimus Rehor sounds the charge of the Fraterri Fidelis. DATAFILE 15: Combat servitors of the Mechanicus Firmamentum hold the entrance to the refinery complex. 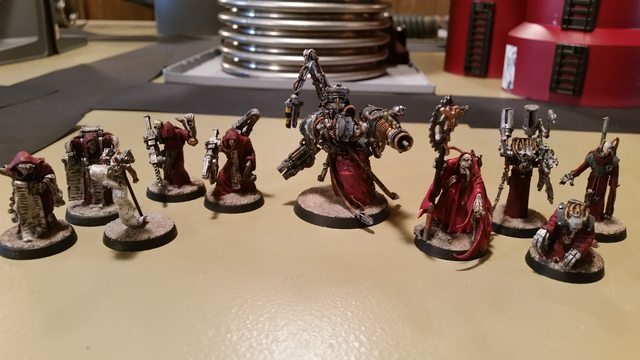 DATAFILE 16: Tech-priests and attendents of the Mechanicus Firmamentum direct the infantry support operations while elements of the Skitarii Firmamentum keep overwatch. The operation would prove a resounding success, and galvanized the morale of Firmamentum's besieged defenders. Edited by CommodusXIII, 15 September 2015 - 07:42 PM. Fraterrus Sextus was forged after the previous holder of that designation was destroyed in the defense of Firmamentum. The Order of Incarnation determined that the next would be of Lancer-pattern, and the new Knight walked directly from the gantries into the battlefield in 976.M41. Datafile 17. Fraterrus Sextus marches to war alongside other members of the Fraterri Fidelis and the Warhound Canis Leto. The Firmamentum design for the Knight Lancer diverges from the typical Mars-based Cerastus chassis, due to the previously-discussed melding of multiple Forge philosophies in its initial Founding. Where the Cerastus chassis is lithe and nimble, the Firmamentum design is robust and brutal. Improvements to its hydraulic systems, especially in its legs, give it a surprising quickness over standard Errant- and Paladin-patterns while its massive ion gauntlet shield affords greater protection in close quarters. The awakening Hastature of Fraterrus Sextus was given to Maxillan Breigor, an applicant potis formerly of the Tesserarii Fidelis house guard. His skill with the storm shield and power lance are increased tenfold through the bond with his demigod machine. Though still a neophyte within the Fraterri, Breigor has already demonstrated considerable skill in terminating the crude but murderously-effective Gorkanauts and Morkanauts that plague his besieged Forge World. Edited by CommodusXIII, 02 May 2016 - 06:41 PM. Datafile 18. Unit ███-Chi-1 on deployment. 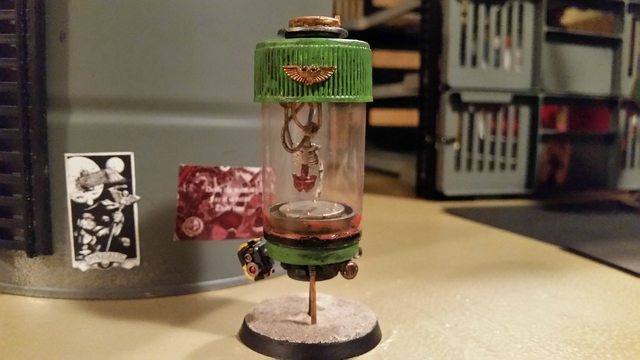 Eliminator Unit ███-Chi-1, "The Hand of the Omnissiah", was the prototype for the Chi-Series Sicarian Project. 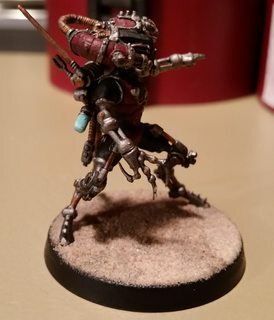 Originally an Alpha of the elite Rangers of the Skitarii Firmamentum, his battle-shattered body was recovered by Magos Organos Eriso Cobol and elevated to higher level of combat prowess. Unfortunately, he came through the augmentation process with his personality intact - a flaw that was corrected in subsequent Chi-Series experiments. 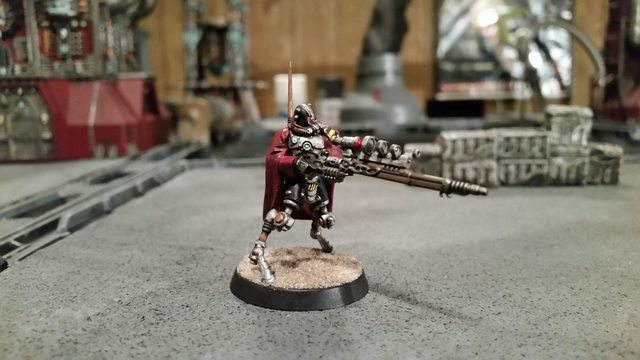 He is often deployed in advance of the Skitarii maniples, remaining hidden until the opportune moment to eliminate his targets. His galvanic miquelet is an ancient and potent weapon, affording greater range, accuracy and potency over the more common transuranic arquebus. Unit ███-Chi-1 is also equipped with a personal shield generator, allowing him to reposition under even the heaviest enemy resistance. Datafile 19. Chi-Series Elimination Units 1, 2 and █. 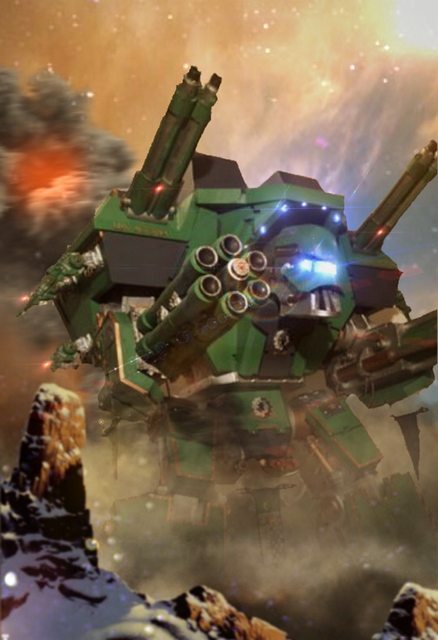 Unlike the brutally-efficient elimination units perfected later in the Chi-Series project, Unit ███-Chi-1 has developed an inspiring reputation among the Skitarii Firmamentum and his appearance on the battlefield is interpreted as a good omen. Unit ███-Chi-1 is considered the pinnacle of Skitarii combat ability, a guardian angel sent by the Omnissiah to protect His servants and execute His directives. Datafile 20. Unit ███-Chi-3 stalks the battlefield. Eliminator Unit ███-Chi-3, "The Desolator", is considered the pinnacle before the precipice of the Chi-Series Sicarian Project. If ███-Chi-1 represents the fear of the unseen and ███-Chi-2 of the unstoppable, then ███-Chi-3 represents the fear of the unexpected. The fleshform for this experiment was an Alpha of the Skitarii Vanguard. Normally, the battle-ravaged remains of these soldiers are catalogued and discarded as hazardous waste. This particular example was found with intensive damage but also completely saturated with radiation. Intrigued by its unusual immunity to the deadly effect of its own rad-weaponry, Magos Organos Eriso Cobol began his work. By the end of the augmentation procedure, six surgical servitors and a junior tech priest had received lethal doses emanating from their subject. The result was worth the sacrifice. ███-Chi-3 is a living nuclear weapon, spending the long quiet between campaigns meditating in a containment vault deep within the Ark Mechanicus Divine Rumination. When called upon to serve, the ancient personal teleporter built into its battlesuit delivers it with pinpoint accuracy into the heart of the Omnissiah's enemies. Alarm klaxons blare, environmental counters overload and soldiers tremble as their mouths fill with the sharp metallic taste of fatal radiation exposure. Their terror multiplies as ███-Chi-3 begins its brutal work, sterilizing the area with its irad-purifier and commanding submission with its phase tasers. Confusion radiates outward as those communication lines not overwhelmed by electromagnetic interference are filled with futile cries for assistance. Edited by CommodusXIII, 02 May 2016 - 06:42 PM. Awesome job, brother! I'm almost a little jealous about the detail you have! excellent job! Good job on "The Desolator." Thank you both very much! I find that my conversion work is much better when I start with a story, and what good is a story if it's never told? Many engines of Legio Fidelis display their battlescars openly. Lux Aeterna has a particularly vicious wound enshrined on its left ankle, dating back to its first execution on the shrine world of Antiphon. After millennia of peace, the reverence was shattered by an Aeldari warhost of surprising proportions. The guileful xenos typically launch hit-and-run attacks of small strike groups. On Antiphon, they appeared with significant engine and superheavy support and caught the defense garrisons completely by suprise. After drawing out the bulk of the Imperial forces with a series of feints, the Aeldari launched a surgical strike focused on cracking open the primary basilica. Lux Aeterna, newly-christened and yet-unbloodied, had remained behind on an initial shakedown walk and provided much-needed support to the defenders. Things took a turn for the worse when the mighty Warlord was lamed by a heat lance, fired from concealment within the defenses of its void shields. The beam sliced cleanly through its talocrural joint in a shower of molten metal and, with the ominous cry of tortured adamantium, the engine fell. A loss of balance is typically fatal for Battle Titans. If by chance it survives the massive impact of its own bulk then the fallen engine is entirely at the mercy of the enemy. Fewer than 10% survive to be righted and returned to the engagement. Lux Aeterna, it would seem, was blessed by the Omnissiah - or, at least, by the luck of the young and inexperienced. Its Princeps, Paulus Aleksandr, was at this time newly-tanked and yet only 55% bionic. In a flash of flesh instinct, he reached out to the walls of his amniotic casket to catch himself. Through the link of the MIU, Lux Aeterna did the same. A minor cathedral complex was demolished beneath its left knee and its left volcano cannon was driven deeply into the rockrete. In a billowing cloud of dust the engine arrested its fall. Lux Aeterna remained knelt in vigil for the following three days, serving as a stationary fortification and an unignorable distraction. Even in this state it steadfastly defended the main approach to the basilica, soaking up damage that would otherwise have been directed at the holy structure. The Skitarii of Macroclade 633 refused to abandon the beleaguered engine and, seeing its obdurance as a divine portent, entrenched themselves in its shadow. They suffered heavy casualties in the following days as they fended off wave after wave of orange-armoured xenos vehicle-hunters and graceful hovertanks. 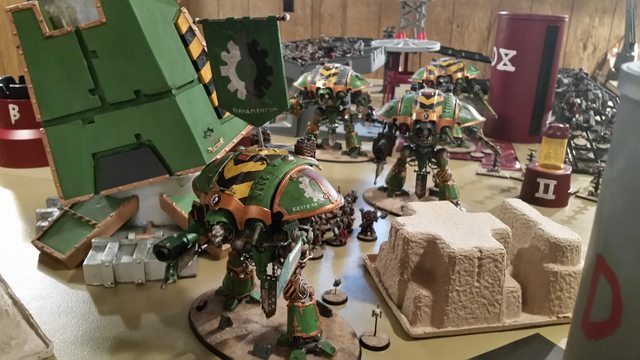 On the third day the Warhound engines of the Legio Fidlis battlegroup sprinted back into the city, followed distantly by two more Warlords, and the Aeldari disappeared behind the smoke of burning buildings. A heavy lifter was brought down from orbit and the stricken Lux Aeterna was borne away for repair. Princeps Aleksandr was lauded for his pious defense of the basilica, and in recognition of their sacrifice Macroclade 633 was rebuilt as the Titanguard of Legio Fidelis. Lux Aeterna itself was honoured by the Archcardinal of Antiphon. In a surprising gesture of ecumeniscism, he gifted an auramite aquila that salvaged from the flattened cathedral where the Warlord refused to yield. To commemorate the courage of the engine, the artifact was melted down and worked into the wound. Lux Aeterna continues to bear this scar with pride. Edited by CommodusXIII, 14 May 2018 - 12:37 PM. Details on the Lux Aeterna's wound are well-written. I hope the Ecclesiarchy recognizes the honor given to their auramite aquila for what it is, instead of viewing as an insult and a blasphemy the fact the aquila was melted down and used to repair the Titan. I'll remember that if I ever end up on the opposite side of an Apocalypse game from a Sisters of Battle army! The Wardens of Light, 53rd Company "Twilight Spears"
Liber Challenge- The Sable Hawks.